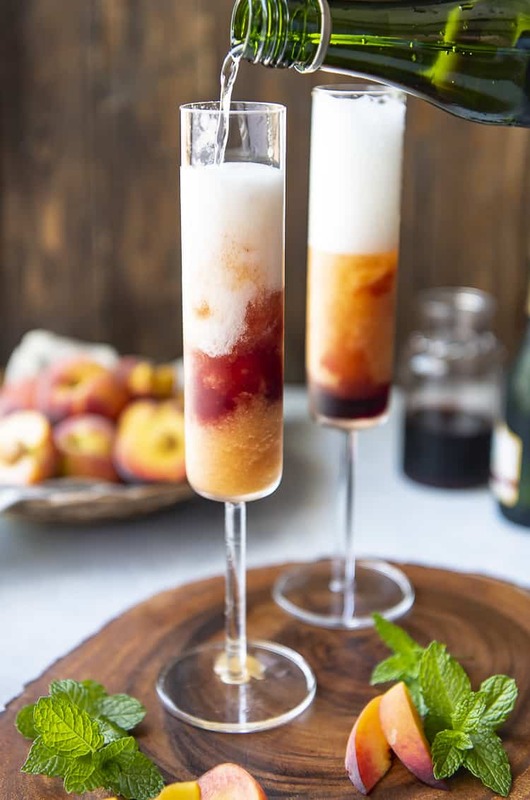 Celebrate summer’s favorite fruit with the best Frozen Peach Bellini! This brunch-perfect 4-ingredient cocktail is dressed up with a splash of grenadine, and will be welcomed any time of the day – even in the middle of winter. I just can. not. stop. with the peaches. And I really don’t wanna. Abe and I spent the last 4 days in Georgia on a weekend vacation, celebrating the life of his cousin (whom we lost in June) with some of his best friends. It was a bittersweet gathering, and even with its sad moments, it was full of laughter and good memories. And of course, food. And peaches, because Georgia. You bet I stocked up on the sweetest fruit of the summer (and my tied #1 fruit ever). And we definitely enjoyed one or three of these refreshing Frozen Peach Bellinis on one particularly warm and humid morning. What is in a frozen Peach Bellini? Peaches & champagne. But this isn’t your ordinary Bellini. It definitely starts like one – with frozen peaches. Whether you preserved them from last summer, bought a bunch on sale, or bought a bag at Trader Joes like I did, any frozen peach slices will do. To help the puree along a bit since we’re not using fresh peaches, add a little peach vodka to the blender. I mean, if you’re boozing it up on a Sunday morning, you may as well go all out. The two peach flavors meld together so well, and once everything is all blended up, the vodka might just sneak up on you. The grenadine in this drink was really just for looks, but it turns out that it also adds a really fabulous flavor to the end result! Your summer Sunday brunch just got so much prettier. 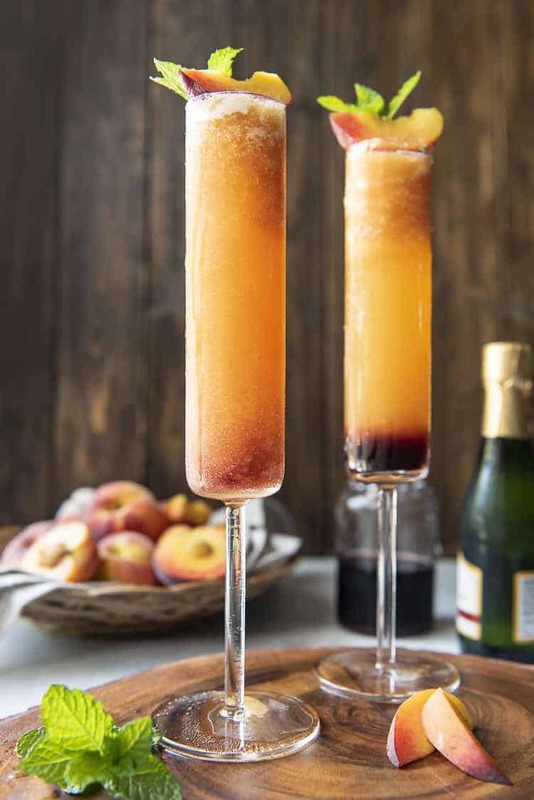 How to make a Peach Bellini – frozen style! 1. First, add your frozen peach slices and some peach vodka to a blender. Puree that goodness until it’s smooth and spoonable. 2. 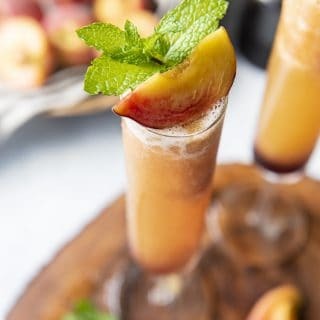 Next, pour the peach mixture into two or three gorgeous champagne flutes – or whatever glassware you happen to have – until they’re about half full. Drizzle in some grenadine to your liking and enjoy watching it mingle with the peach puree. 3. Finally, fill each glass to the top with your favorite champagne or Prosecco. You could even use a sparkling white or rose if that’s what you have on hand, but keep in mind that the end result will be a bit sweeter. 4. 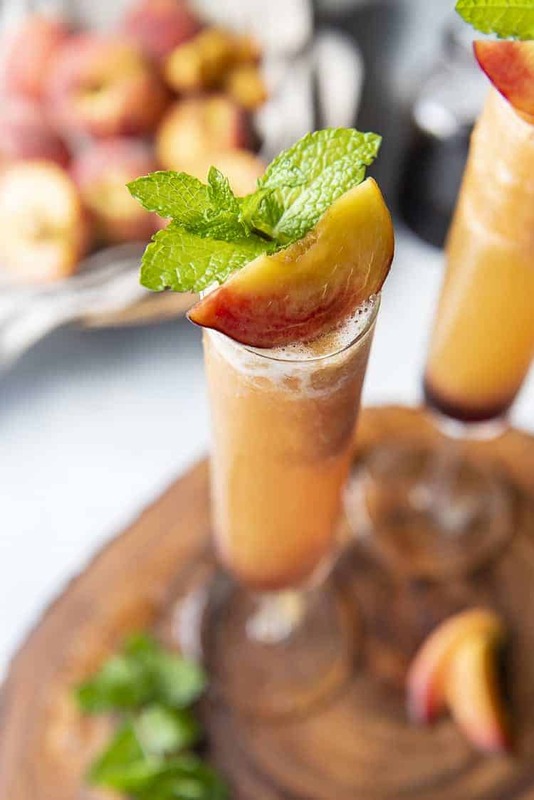 Garnish those drinks with a peach slice or two and a sprig of mint for color. Serve immediately and enjoy! For you non-drinkers, the “virgin” version of this lovely brunch drink can be made by substituting lemon-lime soda or sparkling water for the champagne. Mix up your brunch drinks this weekend with these lovely cocktails! 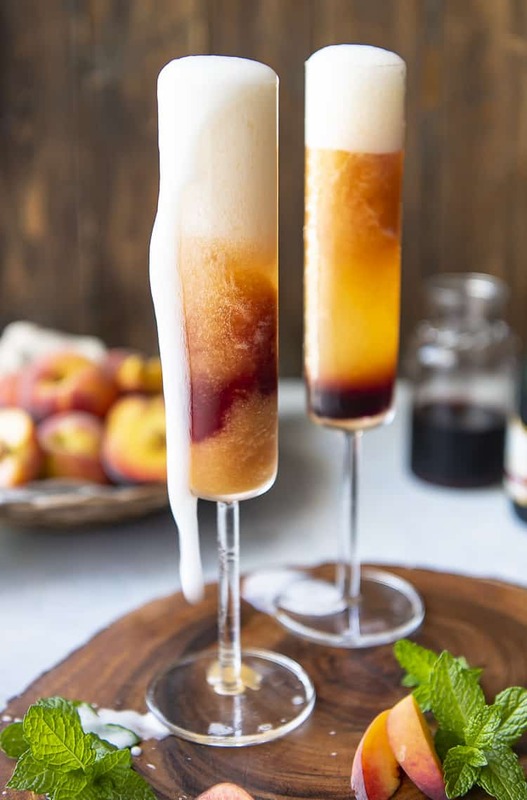 Celebrate summer's favorite fruit with the best Frozen Peach Bellini! This brunch-perfect 4-ingredient cocktail is dressed up with a splash of grenadine, and will be welcomed any time of the day - even in the middle of winter. For a non-alcoholic version of this drink, substitute lemon-lime soda or sparkling water for the champagne. 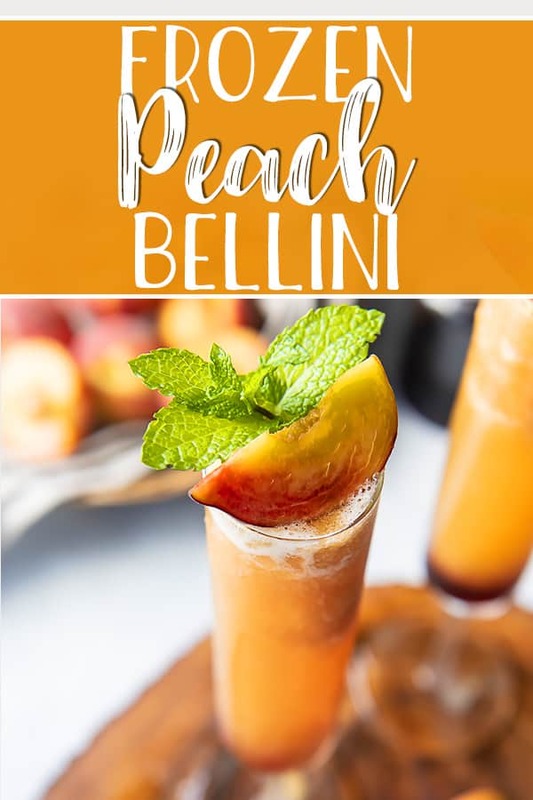 Pin this Peach Bellini recipe for later!